The Variable Tree is displayed along the right hand side of the main display screen. 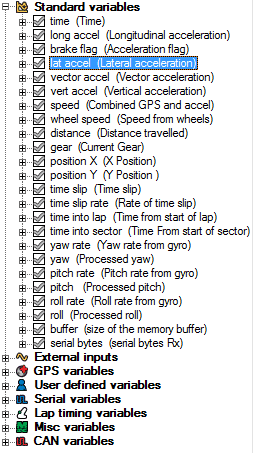 It is a list of variables that can be assigned to the controls. All of the variables can be categorized into six major groups. To associate a variable with a control - i.e. have the control display that variable - drag the variable from the tree and drop it onto the body of the control. Each and every variable has a set of properties. To make alterations to the variables, click on the property that you wish to edit. This will open up a window that is specific to the property that you wish to alter. The Maximum rate of change option will allow you to set a value which limits how much the variable can change over one second. This can be disabled by setting the value to zero. You can select a standard transformation relevant to the selected variable from a drop down list. You can write an equation that will be used to by the DASH4PRO to convert the native values received from the data logger into the value that is shown on the DASH4PRO display. The independent variable x is used to refer to the present variable. e.g. If you wish to convert a voltage value to millivolts, you can write the following equation. This is the name assigned to the variable. Name of any variable can be changed to suit with your requirements. This is a smoothing filter that is used to smooth out any peaks and troughs in the data. Smoothing can be disabled by setting this value to zero. Low alarm f the value of the given variable goes below the low alram value, the low alarm will be triggered on the DASH4PRO and the user will be notified. If the value of the given variable becomes grater the high alarm value, the high alarm will be triggered on the DASH4PRO and the user will be notified. Note: If both the low and high alarm values are set to zero, alarms are disabled for this variable.